I can’t remember when the seed was first planted, but for as long as I can remember, KT has wanted to be a marine biologist when she grows up. She had me paint an underwater wonderland in her room (much to my dismay, it had to be realistic, not silly like I wanted…although I did sneak a mermaid in! 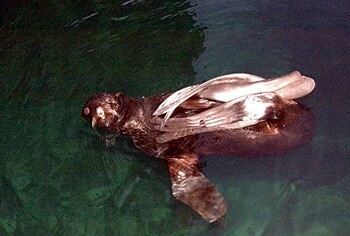 ), she nearly had me signed up for scuba diving lessons with her (I chickened out…I can barely swim!) and for her twelfth birthday, she chose to have her party at the Seattle Aquarium. Seeing some of the behind-the-scenes stuff at the aquarium excited her even more. This is something that our little girl really, really wanted to do. When she found out that there was a teen volunteer program, she was all over it. It didn’t matter that she had to wait four years, she wanted to sign up for it. We had been told that all of the applications would be on file until the applicant was old enough. Last year, we got a letter in the mail telling KT that it was time to come in for her orientation class. I was puzzled, because I was almost positive that the volunteers had to be sixteen and KT had just turned fourteen. A quick phone call revealed that there had been a glitch and letters had been sent to all the applicants. This year, we got another letter. So, I called just to double check and to make sure KT’s name stayed on the list. The supervisor and I got to chatting. I mentioned how long ago KT had applied and that she couldn’t wait until she was old enough to volunteer. Much to my surprise, she told me to have KT come on down and apply to be an Aquateen. In this case, she would waive the age limit because she “liked kids with initiative”. So, this morning, my girl and I ventured downtown to the aquarium. We were told about the entire program and given a huge packet to fill out. All the kids need to write an essay and get two recommendations along with filing out the rest of the paperwork. It’s a huge time commitment (and a lot of traveling into Seattle…shudder!) but oh so worth it! For the first year, the teen volunteers don’t really have much interaction with the animals. They mostly deal with educating the public and working with little kids. If they stay for a second year, they get to do all sorts of cool stuff. 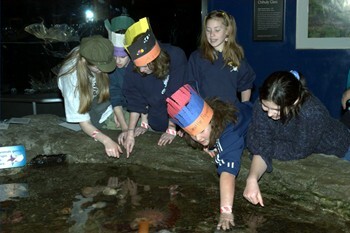 KT will have a chance to “rub elbows” with real marine biologists and see what exactly they really do. Hopefully, she will be accepted. KT’s only concern is that she is a full year younger than the rest of the kids. Personally, watching some of them walk into the orientation over half and hour late, I don’t think she has anything to worry about! How great that KT already has something she is so interested in. Being an Aquateen sounds like a good way to find out whether or not it’s her true calling. BTW, she made an adorable pink octopus! 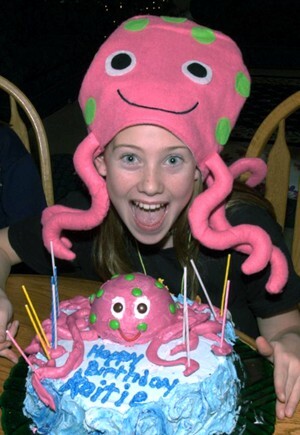 Did you make her octopus hat?? I love the octopus headgear! It’s a shame we don’t live closer, I’d take her scuba diving. Yeah! Kaitie’s dream is comming true! Oh, I am so happy for her. She has wanted this for so long. You just wait, Sue, she will be having you change up her room, make it even more realistic and probably have you put her on the wall with the fish! Peggy, better watch out! She doesn’t know KT like we do! She might find her on her door step with scuba gear in hand! That’s awesome! That was one of my dream careers too. Actually my first. Good for her for diving right into it and having fun. And with her passion and enthusiasm she’ll be light years ahead of some of those kids, she has nothing to worry about. Love her birthday hat. KT has a good head on her sholders. I think this is just the beginning of a passionate career. Good for her and good for you and your support. WOW, all i have to say is what a kid. I love her drive and her initiative. She sounds like a fun one to be around. I think it is great that you are giving her 100% love and support! KT sounds like just the kind of girl the aquarium would want to have on board. She’ll do great there. She’s lucky to have found something she’s passionate about. Thats amazing to have a child that young so focused. I hope she gets all shes dreaming of. That is just the coolest thing ever! I’m so jealous. I can’t wait to hear the stories. That’s sooooo awesome for her!! Good luck, and keep us posted! This is terrific! Tell KT that a young friend of mine started as a volunteer teen at the Oakland Zoo at her age, got to be employed there during the summers and weekends ages 16-18, went on two trips only open to zoo affiliated staff to the Amazon rainforest, and all that experience helped her get into her first choice for college. She recently graduated and got to work at an ocean reserve during her college days. Now she has just passed her exam and been employed with the state park ranger service as a scientist/naturalist at an ocean front state park. She does all kinds of research and loves working with people. So, KT’s opportunity can lead to many more open doors in her future if she would like it to. Best wishes in this new adventure. And sometime when you guys are over here in the city, come see us!